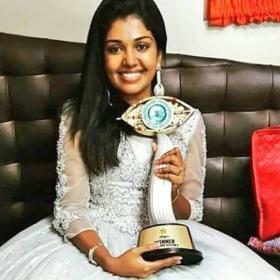 Home » Tamil » TV » Bigg Boss Tamil – 24th September 2017, Episode 92 update: On day 91, Suja gets eliminated from the show. Bigg Boss Tamil – 24th September 2017, Episode 92 update: On day 91, Suja gets eliminated from the show. 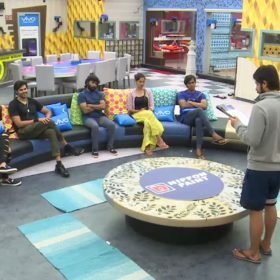 Snehan, Arav, Harish, Ganesh, and Bindu enter the final week in the Bigg Boss house. Snehan discusses with Ganesh and Suja as to who is more deserving to win the points. Ganesh gives his point of view that they have shared 93 days together on Bigg Boss, and he knows his highs and lows. And he accepts any decision of his. Suja tells Snehan that he’s the first person she spoke to after she came on the show and how she has always been honest. Kamal Haasan speaks to the housemates through a television. He asks the contestants who they think Snehan should give his points to. The majority of the housemates pick Ganesh as the deserving candidate. Finally, Snehan gives his points to Ganesh, as he finds him more deserving. Later, Kamal Haasan announces that Suja is eliminated from the show. Snehan tells Arav that when Suja first got out of the house in the previous elimination, everyone in the house felt sad on her exit. He says they didn’t feel the same way about her now, and that’s because of her attitude towards everyone in the past week. Suja then begins interacting with Kamal Haasan. She says that she had a great opportunity meeting with different people in the house, however, they are quite different from what she has imagined them to be. She tells that everyone is good in the house, however, situation and tasks change them. She tells Kamal Haasan that all the tasks, including the task involving standing in the car, were quite difficult. She says that she is half-heartedly exiting from the Bigg Boss house, and if given a chance she would go back. Then the audience begins asking her questions. One member of the audience asks her how she completed all her tasks bravely if she is so scared of ghosts, she says she bundled up the courage to do so. The audience also reminds her that she may have got eliminated because she may have been selfish in the house. They also applauded her for the strength she displayed during the car task. 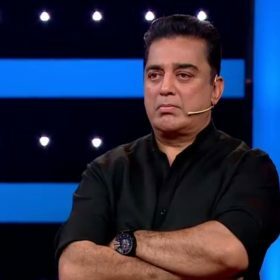 Kamal Haasan reminds Suja that people in the house may not have expressed sadness in the house when she was leaving, because she may have made some mistake herself. On asking who’ll win the competition, she says Arav and Snehan have a strong chance at winning. Kamal advises Suja that she has great opportunities waiting ahead of this show, and asks her never to get disappointed with her exit. He then plays a clipping dedicated to her, featuring all her highs and lows during the show. Bigg Boss Tamil – 22nd September 2017, Episode 91 update: On day 90, Kamal Haasan asks Snehan if he is willing to give all his points to another housemate.